Apple’s decision to not allow “background” apps and AT&T’s decison to not allow voice calls over their network, severely limit the utility of Skype’s iPhone application. No calls unless you can get Wifi. In general, incoming calls are impractical, even if you’re on wifi, since the Skype app has to be the one and only active app in order to receive calls. If you’re doing something else on the phone, like browsing or checking email (or twitter), you cannot receive calls. In test calls, I found the app unreliable even when all the conditions are met. Trying to call the iPhone Skype from a PC, the calling side just continued to ring, even after I answered the call on the iPhone. The Skype for iPhone app then seemed “frozen” where I couldn’t end the call or do anything except hit the big button. When calls did connect (requires the iPhone to be connected via Wi-fi), the call quality was fine. 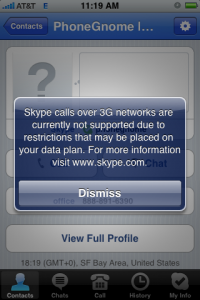 Not being able to make Skype calls except when connected to wi-fi is a pretty big limitation for me. Ironically, when a friend had to call their wife on Skype in Costa Rica recently, I had to let them use PhoneGnome and OpenSky on my iPhone to do so, because that was the only combination that worked on iPhone without wifi. Vopium can’t magically give the iPhone the ability to run “background” apps, so Vopium’s going to suffer some of the same limitations as other VoIP apps in terms of receiving calls. In fact, I don’t even see where Vopium has inbound calls at all – it appears to be strictly an outbound calling service. Further, Skype users can make 100% free calls, but that doesn’t appear to be the case with Vopium, which appears to be pay-always. So I don’t think Vopium is a comparable service to Skype, other than for SkypeOut paid calls.